I have no idea how to purchase such a wonder, but one thing is certain: at last we shall have our bear cavalry! OK, so it’s actually June 8th. I’ve been busy! In the month of May I managed to pain two models (and played zero games!). One was the eminent Kovnik Andrei Malakov. 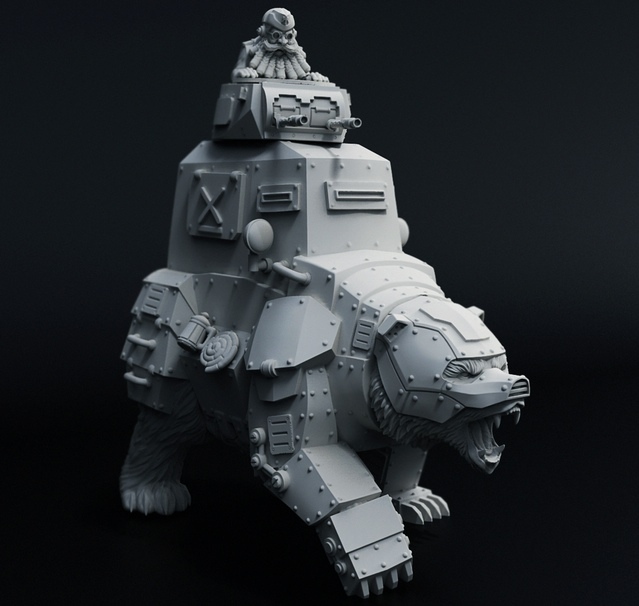 The only reward that I cared about from the Warmachine kickstarter, this guy is going to show up in lists with either a Decimator or Torch (until Grolar shows up). I thought of doing a bit of a conversion on this guy, but he’s a limited edition sculpt. I imagine him sitting at a little bistro table with a cup of coffee or tea, just sneering at the theatre of war that surrounds him. Ah well. There’s always hope for the general release model. The other thing I painted in May was, of course, my plastic Beast 09. I’ve seen a couple of versions of this guy running around with him holding his axe with two hands. However, they always have it backwards. If it’s supposed to be in his right hand, the axe head should be on the right side. I know that this is a fantasy world with werewolves, dragons and zombies, but come on folks! Let’s have some ground rules! In any case, a bit about construction: when I started working on this guy, all the FLGS’s were out of Black Ivan kits. As a result the shoulder spikes here are all green stuff from an instamold. Likewise, the ‘jack rings on his thighs were green stuff as well, pulled via instamold from an Ironclad’s shoulders. Most other bits were freehande sculpts using even more green stuff. The ice on Ice Breaker is Woodland Scenic Water Effect. I have no idea if this guy will be “tournament legal,”but I damn well think he should be! 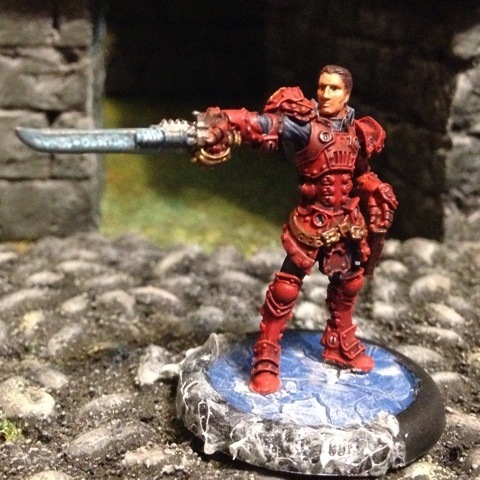 I’ve started painting up my Kickstarter-exclusive Andrei Malakov. One interesting thing I’m noticing about painting this guy up is that there seems to be significantly less “there” than with a full warcaster. No cape. No horn. No bed roll and nap sack. What the heck? How is this guy expecting to survive as a ‘caster! In any case, here’s where he is currently at. My hope is to base him tomorrow and then finish him up by the weekend. I’d like to take him out for a spin at the weekly league game. As far as tactics go, I’ll probably run him with a Decimator for shits and giggles (or if I have the points, Torch). 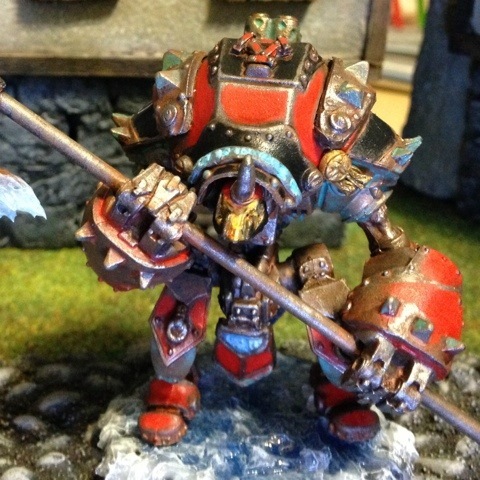 Eventually, Grolar will be his pet warjack (as was foretold by the prophets). However, the matter of ‘caster is still a bit up in the air. I’m starting to gravitate towards a pSorcha list with Beast 09 and the Winter Guard Deathstar and a ton of mercs. He could be useful here. We’ll have to see. Then again, I’m thinking that I might be getting 3utcher for the impending annual celebration of my life. If I’m right, Andrei might be bunking with a pack of dogs before the month is out. Well, he still needs a dull coat, but here’s the finished product: Beast 09 in all his scrappy glory. Not shown: he has “09” on his right shoulder—just in case the giant axe, glowing cowl, etc. etc. aren’t enough to properly identify him. I’ve been working a bit on my plastic kit conversion of Beast 09. 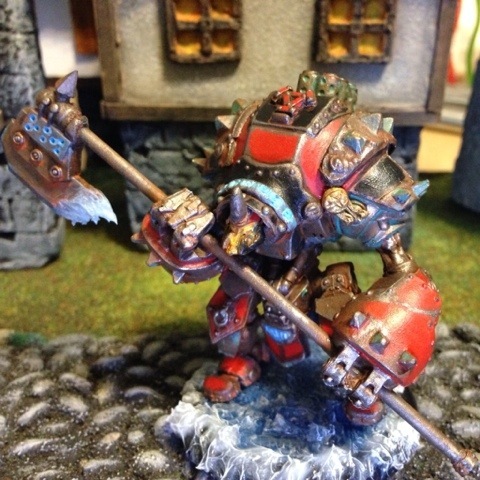 In contrast to most of my warjacks, I’ve decided that even though the Beast is Sorcha’s favourite warjack, she still doesn’t treat him very well. Given her emotionally conflicted state with the return of her nemesis Orsus and the ascendancy of her forbidden love Vladimir, I imagine that she’s hot doing a good job maintaing her jacks. Also, I think that Beast’s temper doesn’t allow much room for regular maintenance. 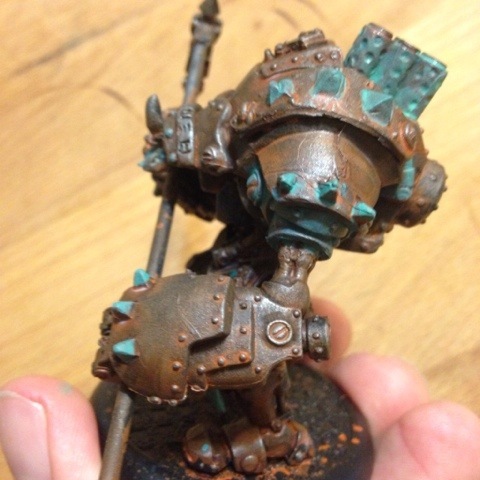 As far as techniques go, I started by using an approach to rust put forward by Mutley on the Privateer Press Forum. Essentially: prime black, drybrush silver, wash with rusty browns, drybrush silver again and then hit with a brown wash. After that, you start painting the… urm… paint. However, I’m not that far in. I took a side ways journey into verigris patina using a tutorial I found on Tiny Worlds. (I used this on my Convergence of Cyriss terrain piece last year.) I took these pics while waiting for the wash to dry. I still need to dry brush the bronze areas with bronze and then with a bronze/gold mix. The plan is to finish the patina today and perhaps start on his icy axe and arcane glow. I’m reticent to begin blocking in what scraps remain of Beast’s paint. I still haven’t decided if I’m going to paint him canon or go with the dark scheme I’ve been using for most of my jacks. 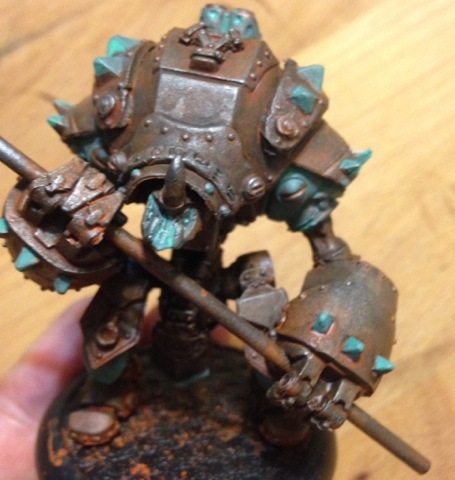 Since I’ve gotten back in the saddle of painting more than just my Warmachine army, I’m realizing I need to specify a bit and state this is my Warmachine painting wrap-up in this post. 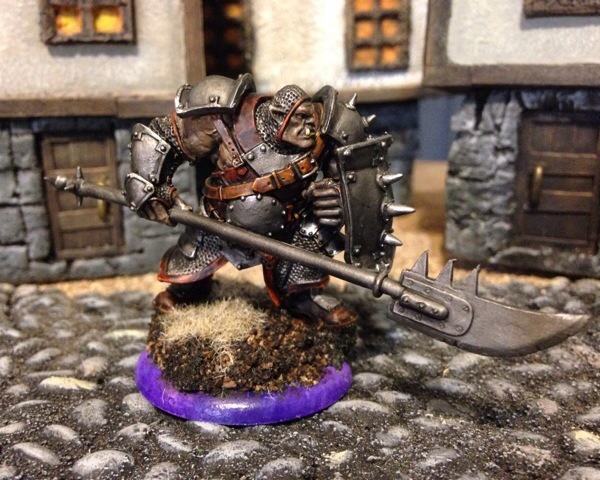 Sadly, with all the things on my plate and my work table, I did not get much painted for Warmachine this month. I did make some progress on two warjacks with another one in the process of assembly, but none of them are finished as of yet. 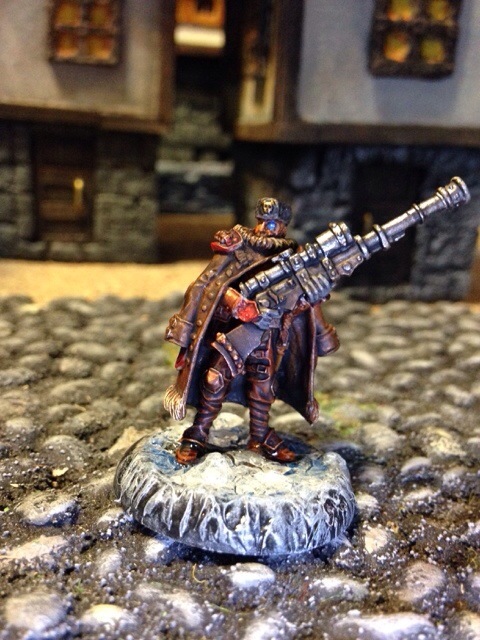 I did finally purchase and paint the Widowmaker Marksman solo. I brought the Widowmakers to the last game of the Charsaug league at my FLGS yesterday sans Marksman (he was at home with wet icicles). They did next to nothing offensively in the game, but they did tie up a Warpwolf long enough for the Butcher to come in and slaughter it from behind. 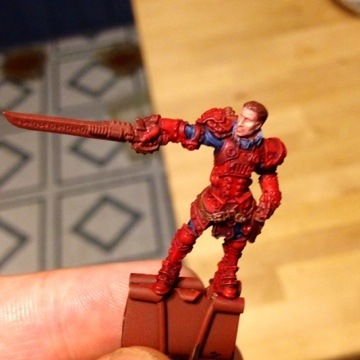 While I realized again yesterday just how much I love Khador’s bald-headed psychopath, I’ve been trying to paint up a tier four list for Kommander Harkevich. 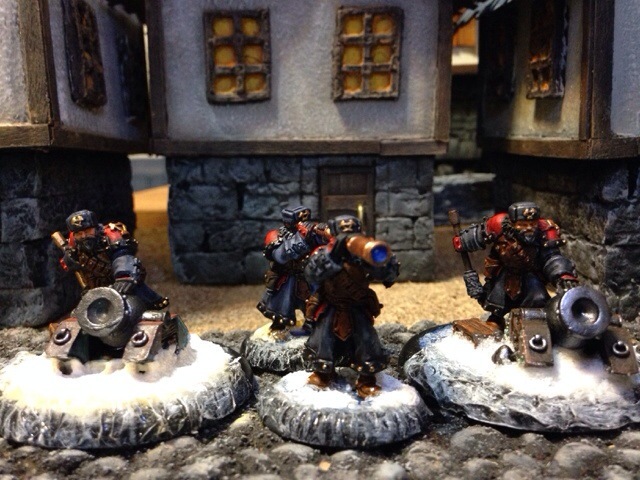 To this end, I painted up ANOTHER unit of Winter Guard Mortars. I have had mixed luck with these guys so far this year. Usually I put Harky’s Fortune spell on one unit to help with hitting while I have Kovnik Joe yell at the other unit to boost their attack rolls. I managed to take out an entire unit of Arcane Tempest Gun Mages with AOE’s, but I’m still not worth their worth the points. For example, yesterday’s game had Kommy Joe yelling for boosted attacks from the Winter Guard Death Star while the Butcher boosted the damage. CRA’s and sprays from the Death Star with that kind of double boosts is just golden. I’m seriously wondering why I play anyone other than the Butcher. And just so you don’t think I’ve just showed you the same unit two months in a row, here’s a shot of both Mortar Crews: 6 points of inaccurate deviating AOE’s with a ridiculous range. One of my friends just posted on everyone’s favourite social networking cite that his Warmachine Kickstarter miniatures just arrived in the post. So, perhaps I’ll have Dandy Andy posted here soon! 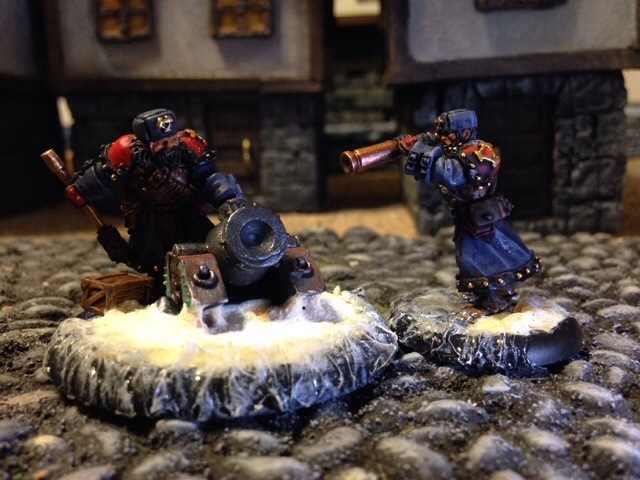 I’ve been involved in the 2014 painting challenge over on the Privateer Press Forum. 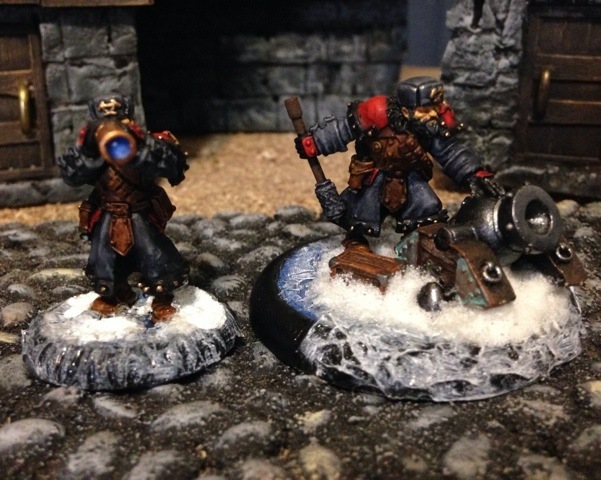 Here’s what I painted for Warmachine in the short and cold month of February. 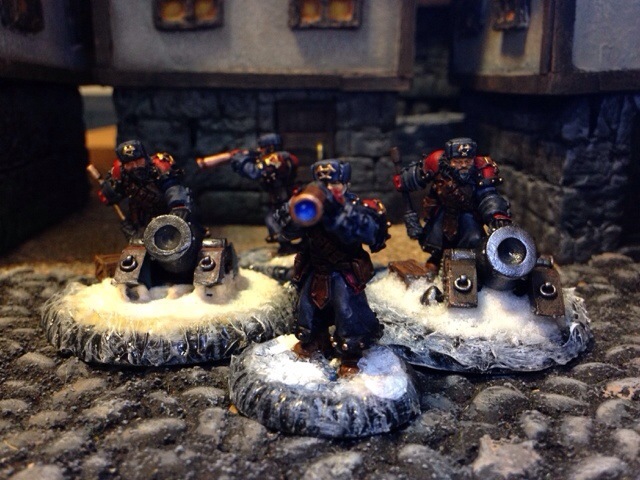 First up, is one of the two Winter Guard Mortar Crews I need for Harkevich’s 4th tier. I tried to work a bit with snowdrifts on these. There’s also some nice patina on the mortar itself. I need to paint a second one of these for tiers, so I might mod the poses. We’ll see. 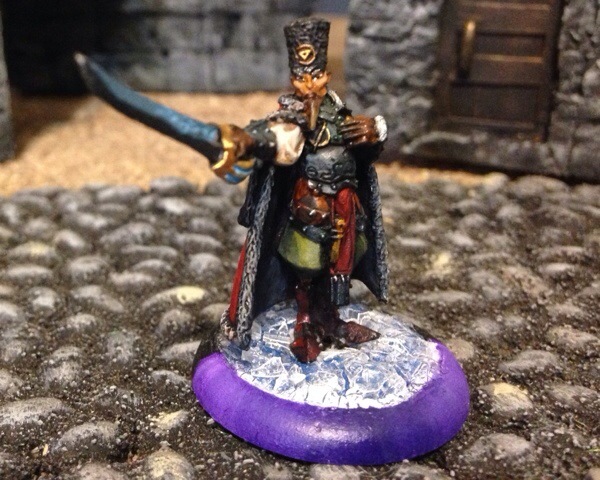 Next up is Koldum Kapitan Valachev. While all my Khador has the front arc marked with ice, I used the gradient purple of my mercs here so as to help show his dual role. He’s by no means perfect but suitable for tabletop. Finally, we have the Ogrun Bokur. I hated to have to elevate this guy; but I was having a horrible time getting him on base, even with pins. So, he’s standing on cork covered with several kinds of flock. I’m happy with the model, but the base really pisses me off. He’ll probably be a staple for whatever the other list is I run this year (probably eIrusk or pSorcha with tons of mercs). Next month will be focused on warjacks. I have a plastic Beast 09 mod primed; I’m about 90% on modding a metal Devastator into a Demolisher; and I have a second metal Devastator that I need to assemble as well. That will amount to 29 points if I can get my act together. 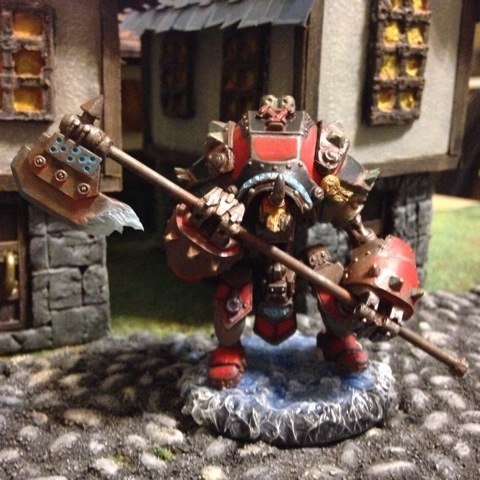 Oh, and I have an Ork Blood Bowl team I need to work on if I can find the time….